Photo: Courtesy of Rockit Bar & Grill. The holidays aren't quite here yet, but that doesn't mean you can't start planning your baking schedule — especially since we are surrounded by major pumpkin inspiration this time of the year. 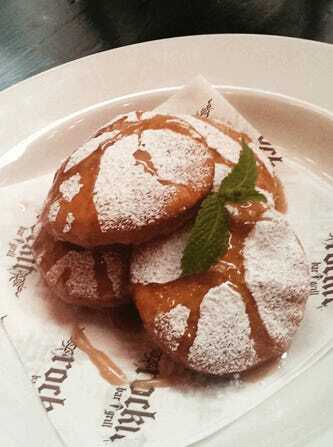 But, if you're starting to get a blasé attitude toward the same, old pie, we've got a unique recipe that doesn't require a fork to eat: sopaipillas with a cinnamon honey butter emulsion, courtesy of Rockit Bar & Grill in Chicago. Made with a base of pumpkin dough, these fried puffs are filled with a finger-lickin' sugar pumpkin purée and topped with a ridiculously rich, buttery cinnamon and honey concoction that will blow your mind — and your diet. Of course, there's no need to wait for Thanksgiving to try these morsels out. 1. In a mixer, combine the pumpkin, flour, baking soda, baking powder, salt, sugar, butter, and milk. 2. Mix until a smooth dough is formed. Add a couple of extra splashes of milk if the mixture seems too dry. 3. Wrap dough and allow it to rest for 20-minutes. 4. Once rested, roll out dough so that it is .5 centimeters thick. 5. Cut out pieces using a two or three-inch cookie cutter. 6. Poke each cutout with a fork multiple times to prevent it from puffing up. 7. Heat the oil in a pan to 350 degrees. 8. Place the cutout pieces of dough in the oil a few at a time. You need to maintain the oil temperature, so don’t add too many pieces at once. 9. Fry until cooked all the way through. Be prepared to sacrifice one or two to learn how fast/slow they cook. 10. Remove from oil and place on a plate lined with paper towels. 11. Dust heavily with powdered sugar and drizzle with cinnamon honey butter emulsion — best served right away! 1. Put the honey, melted butter, water, salt, and cinnamon all in a blender. 2. Flip it on and wait until a smooth, even consistency is achieved.